on the stainless steel x-shaped base. 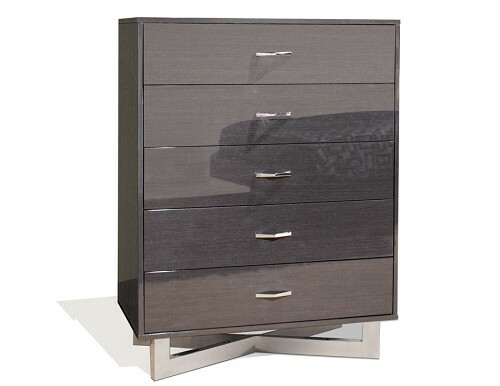 The chest is perfect for storage with its five large drawers and stands on stainless steel x-shaped base. Available in gray oak lacquer. Gramercy joins old Hollywood elegance and style with modern functionality and glitz. Handsomely tailored, deco-inspired cases feature a crinolated façade in an soft silver finish, antique silver and crystal jewelry hardware, framed by a rich sable wood finish on dramatic cathedral walnut veneers and solids on the tops, sides and bases atop graceful straight legs. Two bed options include an elegantly shaped panel bed in the sable finish as well as a show-stopping upholstered bed in a high performance French gray velvet, tufted with crystal buttons and finished with soft silver nailhead trim, featuring hidden touch-latch wooden shelf storage on each side. Completing the chic bedroom are a unique clipped corner accent chest with gracefully splayed legs, beveled landscape mirror detailed with an antique mirror and open fretwork frame. Lingerie Chest features 7 drawers. Drawer Chest features 5 drawers. Accent Chest features 3 drawers. 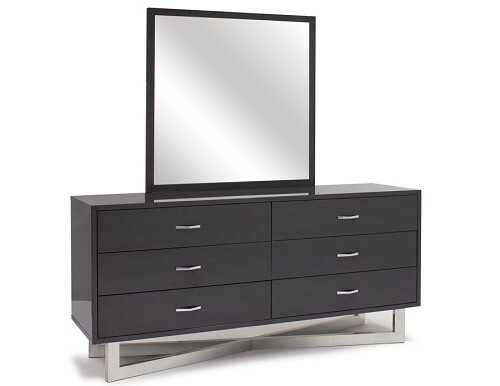 Media Chest features 4 drawers, 2 open compartments with wire management in back panel. Dresser features 9 drawers and support leg. Mirror features 1″ bevel and antique mirror with fretwork on frame. All beds features 4 slats with support leg for regular FB.